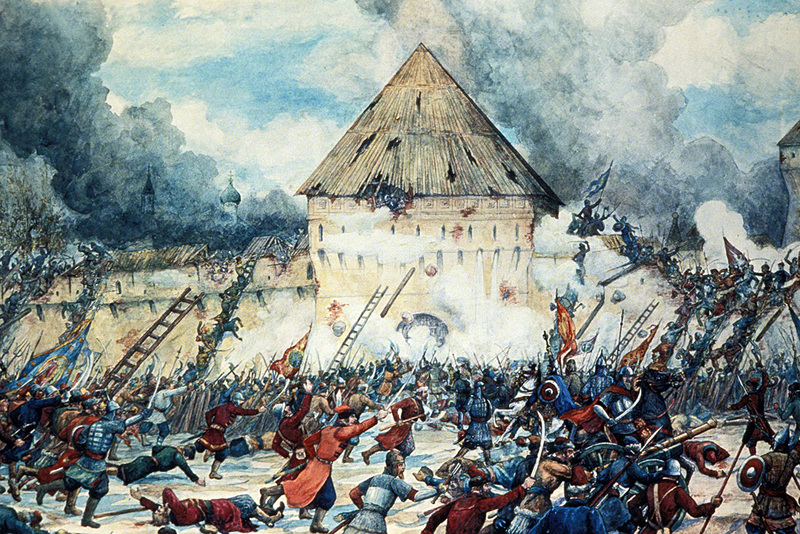 Battle with polish interventionists at the vladimir gate of kitai-gorod (china town) in moscow, 1612, watercolor by g, lissner. In the early 17th century, the united Polish-Lithuanian Commonwealth was one of the most powerful players in Eastern Europe. Taking advantage of the turmoil in Russia, the Commonwealth sought to install its own candidate on the Moscow throne and was very close to winning the centuries-long bitter rivalry with its eastern neighbor. This startling description from the historian Vasily Klyuchevsky greatly contrasts with the position that the young Russian state had enjoyed only several decades before when it had conquered vast territories to the east and introduced a number of political reforms. However, in the early 17th century, these successes dating from the early reign of Ivan the Terrible were already part of the past. With the death of Ivan’s successor, the Rurik dynasty, which had ruled Russian territories for seven centuries, was over. Rulers of Russia after the fall of the Rurik dynasty were not popular and that contributed to the success of False Dmitry I, an adventurist who claimed to be a son of Ivan the Terrible. With the acceptance of Moscow nobility and support from the Poles, who were a powerful player in this part of Europe at the time, he was proclaimed the Russian czar in 1605. False Dmitriy I swearing Sigismund III introduction of catholicism in Russia / Radishchev Art MuseumMoscow nobility soon became dissatisfied with this ruler, however, and he was assassinated less than a year after his coronation. The nobility then chose another czar from their own ranks, Vasily Shuysky, whose authority was soon challenged by another False Dmitry, the Second, and the Poles. After some struggle, Shuysky was forced to take monastic vows and was eventually handed over to the Polish king. Fearing False Dmitry II more than the Poles, the nobles asked the Polish king’s son to take the Moscow throne and invited Polish troops into the Russian capital. This internal struggle, which had already been challenging the Russian state for several years, then turned into a fight for the nation’s survival. It seemed that the country was mired in conflicts within the nobility. There were Poles in the Kremlin and Swedes had carved up a huge piece of the Russian north that would never be reclaimed. However, the state did survive, and the roots of the solution came from an unexpected place. As 19th-century Russian social thinker Konstantin Aksakov put it, underneath the ruined state there remained a solid societal structure. Middle and lower classes came together and took the fight for the country into their own hands. Kuzma Minin, a meat salesman, was elected as a municipal official in Nizhniy Novgorod (400 kilometers from Moscow) and became a man who headed the struggle to defend the nation. In 1611, he was made a leader of the People’s Volunteer Army, a second attempt at forming an army to liberate Moscow from the Poles after the first try was unsuccessful. The formation of the army began in September when Minin made an address to the public. He called upon his fellow citizens “not to spare their lives” and to donate everything they owned to the cause of the country’s liberation. Minin went on to take an administrative role in the organization of the army, and Prince Dmitry Pozharsky became the military leader. Pozharsky had won a number of battles while serving previous czars and was a well-loved leader at the time. The organizers of the People’s Volunteer Army raised considerable funds, gathered several thousand soldiers and started to march slowly towards Moscow, drafting new recruits along the way. Having reached almost 10,000 troops, the army finally reached Moscow in August 1612. Meanwhile, a large Polish army, with 12,000 soldiers, was approaching Moscow from the west. The Poles wanted to free the Polish garrison that was currently besieged in the Kremlin by the remnants of the first Volunteer Army. The garrison was in a terrible condition — they had run out of food and resorted to cannibalism. The Volunteer Army regiments arrived at the center of Moscow first and took their positions there. Polish troops, under the command of hetman Jan Karol Chodkiewicz, then attacked the Russians on August 22. The battle lasted for six hours, but Chodkiewicz and the Polish army did not manage to reach the Kremlin. The final battle took place over the course of two days. After five hours of heavy fighting in the center of the city, Polish troops broke Russian ranks and forced the Volunteer Army regiments to retreat. However, they were not able to build on this success and lost a lot of manpower as a result. While the Poles were recovering, the Russians managed to regroup and launched a vicious counterattack. Especially effective was an unexpected advance by Kuzma Minin, accompanied by several hundred horsemen. A vital blow was also dealt by the Cossacks. As chronicles of the event point out, the Cossacks had begun to retreat but were reinvigorated thanks to the influence of a powerful speech by monk Avraamiy Palitsyn. He assembled the deserted troops by ringing a church bell and addressed them with touching and inspiring words. Eventually, the Poles could no longer hold their positions and fled Moscow. The battle had been won by the Volunteer Army. This sealed the fate of the Poles position in the Kremlin and they surrendered within a couple of months. As one Polish chronicler noted, with this defeat, Polish aspirations to gain control of the Moscow government were lost forever. This tumultuous period ended in the following year with the ascendance to the throne of Czar Mikhail, the founding father of a new dynasty — the Romanovs. This material is a part of a series of articles by RBTH describing great battles of Russia’s history and their significance.